It's Add A Little Dazzle and Avery Elle week! This week the Avery Elle design team is playing with some amazing metal sheets from Add A Little Dazzle. These sheets work great with our Elle-ments dies! After visiting here, be sure to check out the Add A Little Dazzle blog for even more inspiration! Be sure to comment on our company and designer blogs throughout to week to be entered to win one of two prizes - a $30 Avery Elle Gift Certificate or a prize from Add A Little Dazzle! Winners will be announced on Monday, October 6th. I loved all the shiny colors, but I was really drawn to the the gorgeous teal! As much as I love traditional Christmas colors, I love a fresh blue/pink/red combo for Christmas cards. 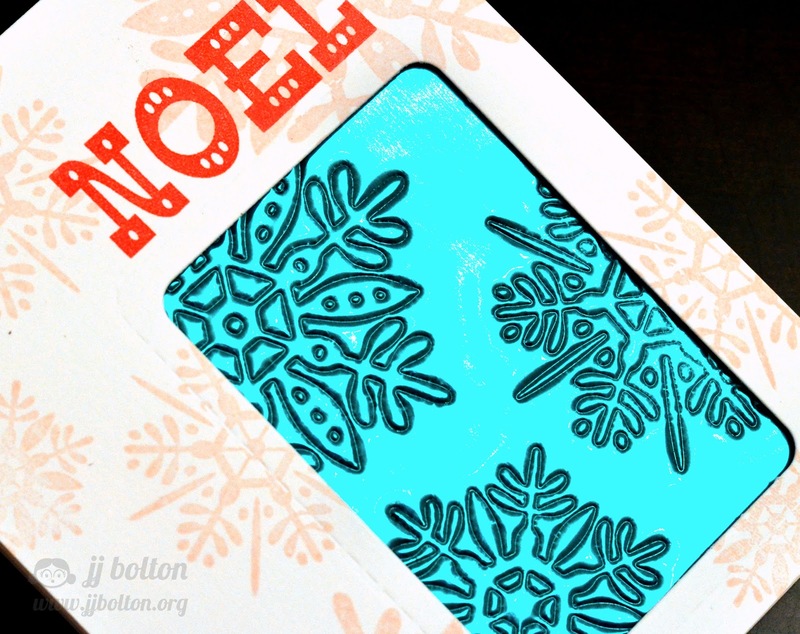 So I used the Noel dies and matching stamps to create this easy-to-make card. The dies do cut the metal sheets, but I really liked the embossed look and left them as is. For reference, the metal sheets feel like a thick, stiffer tin foil sheet. Look at the shine on this stuff! I placed my embossed panel behind a window that I cut with my We R Family dies, and then I stamped a subtle background with the coordinating snowflake stamps. Fun, right? 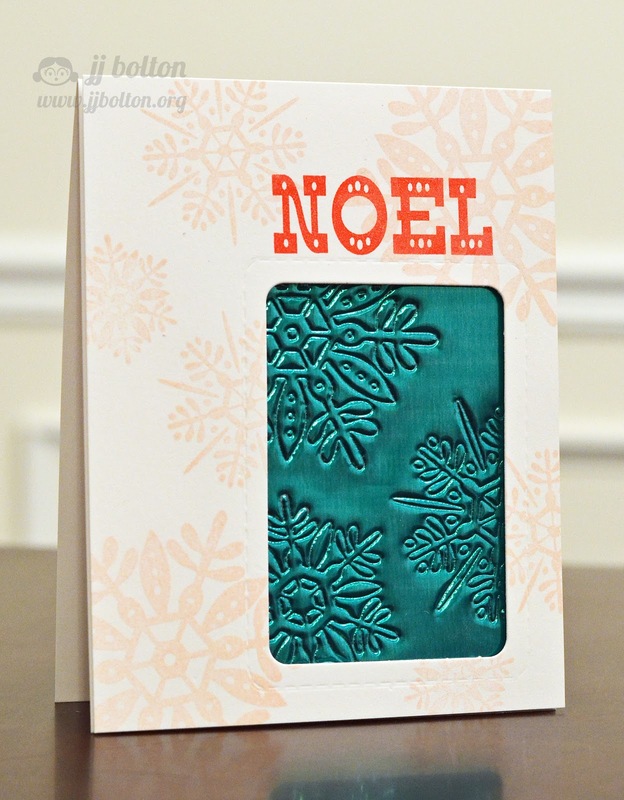 I really love this nontraditional color scheme, the embossing on that sheet looks so cool! Cute card! That blur metal REALLY makes the card pop! Love the background and the metallic "window" ROCKS!!! Amazing card! TFS! Beautiful card. I love the color of the metal. The embossing and the matching stamping made for a wonderful project. Thanks for sharing. 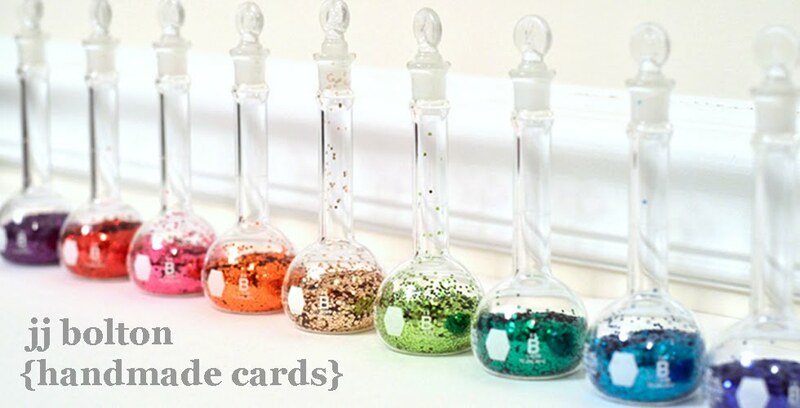 I love the colors that you used on your card. It is so pretty. Fabulous card, the colors are perfect together and the metal shines so beautifully. Awesome teal panel... love the look of the embossed craft metal! Gorgeous snowflake designs! I love the embossed look of the snowflakes on the metal and ooooh! that teal color is fabulous! Absolutely dazzling!!! So effective with the metal in the little window!! How pretty. I love window cards and you did a great job stamping and embossing. These metal sheets are so beautiful embossed. A beautiful card! Love the embossing! LOVE the BOLD & BRIGHT NOEL and GORGEOUS embossed snowflakes in the window!! love it JJ, very awesome and pretty! Love how the bright blue metallic pops the embossed snowflakes. I love the embossed metal sheet! Clever and super nice design. Love it! OK .. now I NEED to get some of the metal sheet!! LOL! What a contrast, the soft stamping against the shiny metallic crisp die impression! Absolutely GORGEOUS card, JJ! I love all the dimension you created with these snowflakes...so striking! Paper Smooches October Blog Hop! Studio Calico Walden Kit Sneak Peeks!